After spending Thanksgiving week in Utah to visit the Mighty 5 National Parks, Julia and I made our way up to her parents’ ranch in Stallion Springs to help slow the adjustment to working life. Stallion Springs is an incredible little town situated at the base of the Tehachapi mountains. There a ton of great horse trails the crisscross the town, but for this hike, we decided to try for a peak. A lot of the land in the area is private, which means there aren’t a lot of established trails leading up to these peaks. Luckily, there are an abundance of dear and elk in the area (and the people who hunt them), and they leave a whole series of easy to follow game trails. This area is also home to the Tejon Ranch, the largest expanse of private land in California, and a stretch or the Pacific Crest Trail. The peak we were heading for on this day is unnamed as far as I know. In the pictures above, you’ll be able to see a range crested with snow. Our goal was to make it to the lowest peak in that range, and scout the other peaks for another time. Our starting elevation was around 4000ft, and we climbed about 2500ft to the unnamed peak at around 6500ft. I started this hike with Julia, Isla, and Lilly on a dirt road heading southeast in the direction of Cummings Mountain, one of the highest peaks in this range at 7780ft. After hiking for about a mile on the dirt road, we followed a game trail alongside a wash that took us uphill towards our desired destination. Isla and Lillly were having a ton of fun at this point. They’re so used to having to stay on trail, and the freedom that came with some off trail exploration was all to evident on their joyous faces. After about a mile of hiking under the cover of a trees, we broke into a clearing and crossed paths with a cattle road. It was really nice to hit this cattle road, as it had been slow going under the trees. I could tell Isla and Lilly were excited as well, as they took off running in a full sprint, nipping at each others ankles the entire time. The views from the edge of the cattle road were pretty spectacular, offering a birds eye view of Stallions Springs, the farms before Tehachapi, and the haze of Bakersfield. We took some time to rest a little and regroup here before continuing on uphill. We followed the road as far as we could, and branched off to head uphill when it began to turn back away from our desired peak. We could start to feel the elevation at this point, and were excited to finally be reaching the snow and ice we had seen when we started the day. The footing was a little less secure, but watching Isla and Lilly go crazy made it all worth it. Just before reaching our desired destination at the top of the mountain, we passed another cattle road. This time, the road was covered in snow, but it allowed us to get very close to the summit without much effort. The actual summit of the peak we hiked up to was covered in a pretty thick grouping of trees. Nonetheless, it was a lot of fun stringing some access roads, game trails, and cattle roads together for a hike without much planning or direction. really beautiful! How lucky you are to have access to such beautiful places! Thanks! We’re fortunate that Southern California has so many great places to explore. Beautiful pictures! Isla and Lilly are adorable. Thanks! It was a fun one. 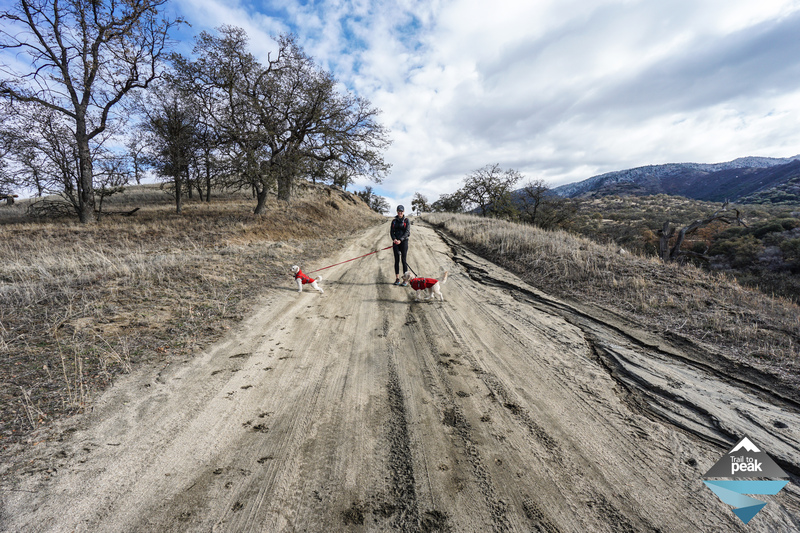 We can’t wait to do a little more exploring in the Tehachapi mountains! Very cool, Brian. I’ll have to check on the road the next time we’re up there. We just drove in the direction of the mountain until we hit the hills. I’m sure you’ve seen all of the trail signs since you’ve been up there. There is a post at the base of this hike next to a turquoise house I believe. I know that’s not very helpful, I’ll try to get an address and location when we visit in a week or two. Great Thanks. I have been able to explore a lot of the area. Fun just following a trail and seeing where it takes me. Waiting till it cools down to try and get to Tehachapi peak. Thanks for your great site hear. I really enjoy following you guys on your adventures. Glad you’re enjoying the area. I’m hoping to do Tehachapi Peak soon as well!